Unfortunately Phant, our data-streaming service, is no longer in service. The system has reached capacity and, like a less-adventurous Cassini, has plunged conclusively into a fiery and permanent retirement. There are several other maker-friendly, data-streaming services and/or IoT platforms available as alternatives. The three we recommend are Blynk, ThingSpeak, and Cayenne. You can read our blog post on the topic for an overview and helpful links for each platform. The code in this tutorial will need to be adjusted to work with the other data streams. In the world of tomorrow, everything in our homes will be connected. The Internet of Things (IoT) is the real-world manifestation of that vision. The world of IoT includes network-connected appliances that have not, until now, had any such sophisticated capabilities. The Nest product line, which started with intuitive smart thermostats and is expanding into other products, is one set of offerings in a growing market of so-called "smart home" offerings. Amazon's Echo, which combines several home integration aspects into a single platform, is another. There are many types of smart-home systems. Some remotely control a home device, like automatically turning lights on or off at certain times. Others optimize the behaviors of home systems, perhaps switching a home's electrical supply between solar and grid power at different times of the day or season. 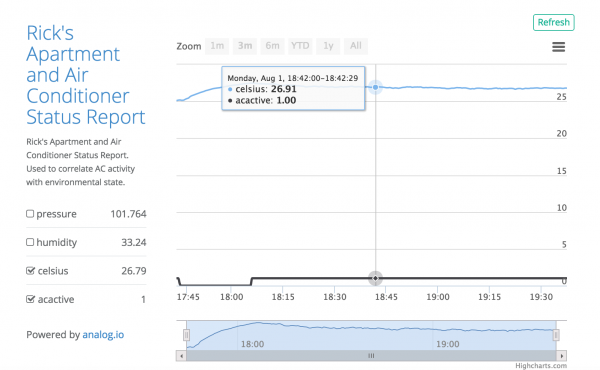 In this tutorial, we'll hone in on the monitoring aspect of smart systems. 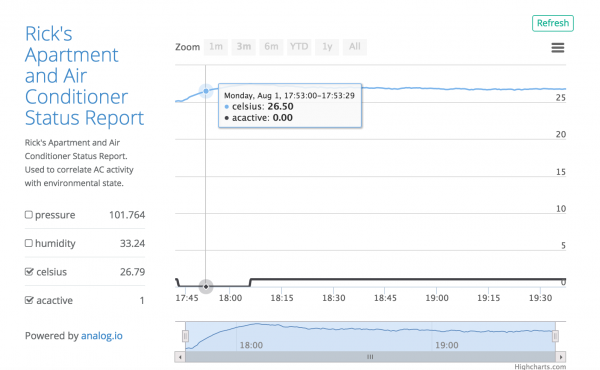 We're going to build an air-conditioning monitoring device to collect information and store it in the cloud. Data points from the sensors in the device will be uploaded to and stored in Sparkfun's Phant-powered data.sparkfun.com service. If this is your first time experimenting with the Tessel 2, there are a few things you gotta do first! We recommend reading through our Getting Started with the Tessel 2 before diving into this project. We promise, it wont take that long. 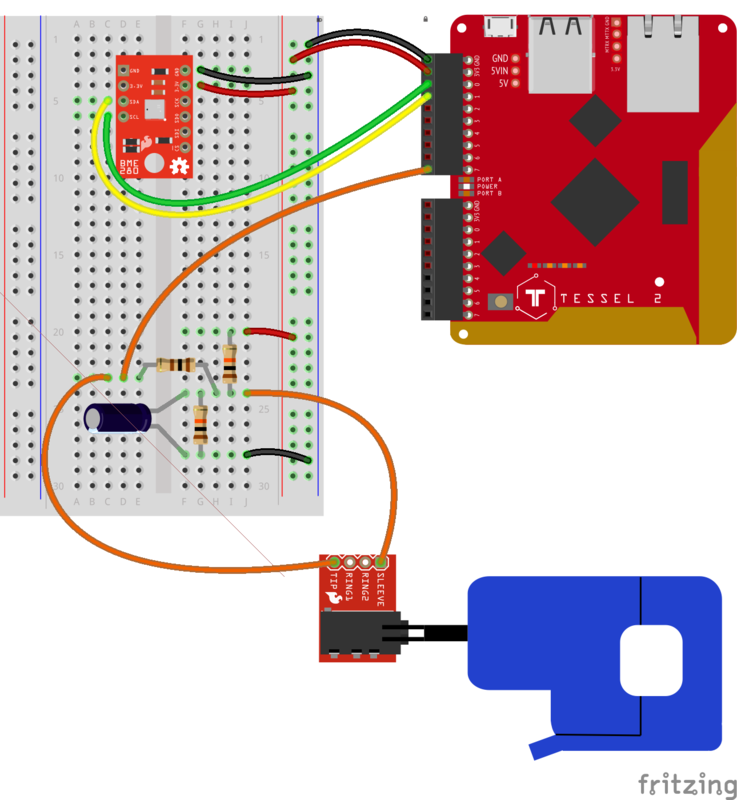 The entire Johnny-Five Inventor's Kit Experiment Guide is great stuff if you're starting out with the Tessel 2. If you've never worked with the data.sparkfun.com service before, the guide below will help you get started making your own stream for collecting data. The non-invasive current sensor has a "jaw" that clamps around a wire. It can read the amount of current flowing through the wire without the wire itself having to be modified (ergo, non-invasive). By plugging the air conditioner into the extension cord and then using the current sensor to detect how much current is going through the extension cord, we'll be able to tell when the AC is running. The current sensor's output is a current much lower, but linearly related to, the current it's sensing. 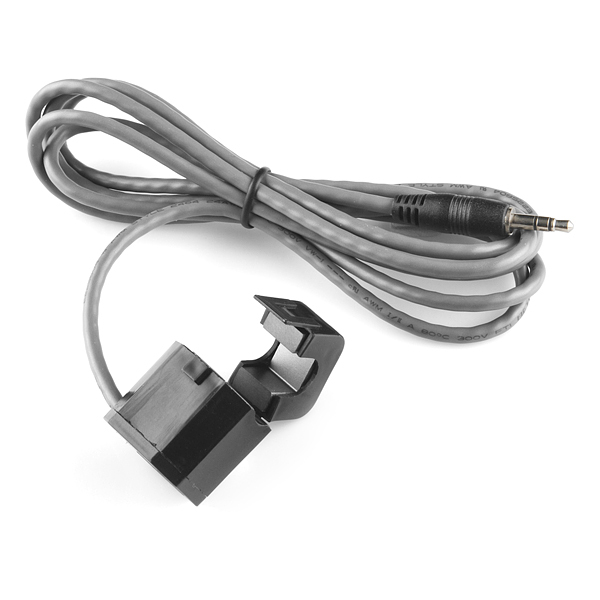 The non-invasive current sensor has a connector that looks like an audio jack on one end. It is a TRS (Tip-Ring-Sleeve) connector, shown on the left side of the diagram below. You may also have seen TRRS connectors (Tip-Ring-Ring-Sleeve, right side of diagram), which are commonly used for handsfree headsets. The TRRS breakout makes each of the pieces of a TRRS connector (the tip, each of the two rings and the sleeve) accessible. 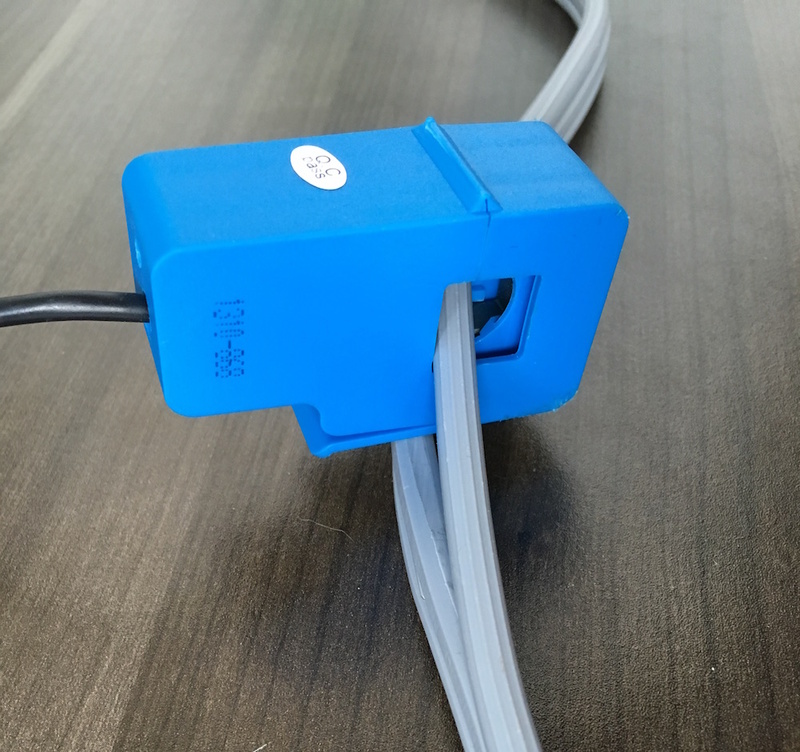 The TRRS breakout will allow us to easily connect to the tip and the sleeve of the current sensor's connector so we can read its values. Let's begin by assembling the environment monitoring device! Add the current sensor's voltage divider circuit. 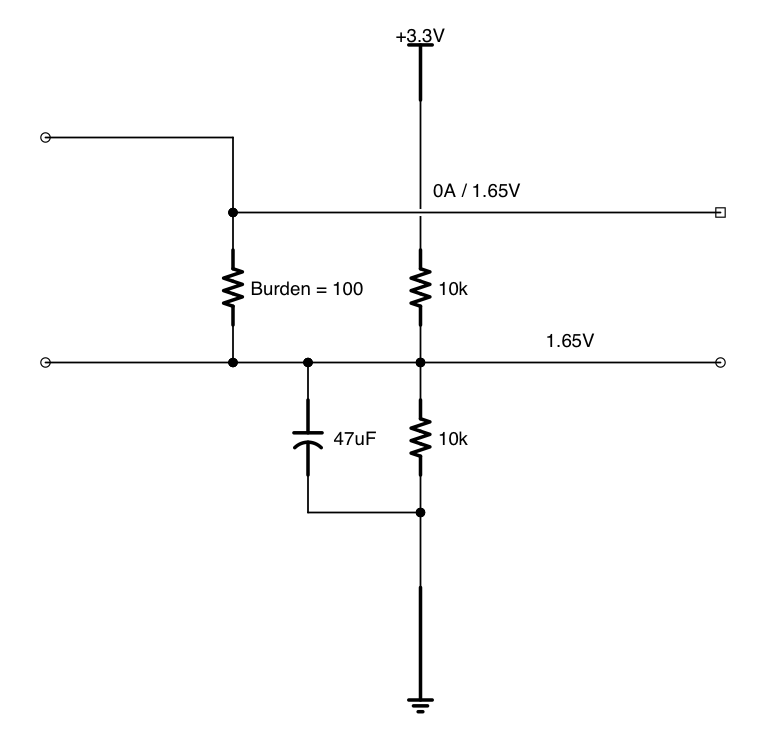 This voltage divider circuit "conditions" the output of the current sensor so that it is constrained to a range of input voltages that can be read by the Tessel 2 (0 - 3.3V). If you'd like to learn more about the technical details, you can read about the circuit it is based on, described in the article CT [Current Transformer] Sensors — Interfacing with an Arduino, OpenEnergyMonitor.org. Next, you'll need a sharp utility knife and a safe, clean cutting surface. On your surface, lay the Air Conditioner Extension Cord flat, and use the utility knife to separate one of the three joined sections of wire. Make the cut approximately 3 to 4 inches long—just long enough to put the current sensor's top "jaw" through and safely clip it together. WARNING: If you expose ANY wire during this process, immediately discard the entire extension cord and start over with an uncut cord. We recommend purchasing two of these just in case. Exposed wire will put you at risk of fire or electrocution. 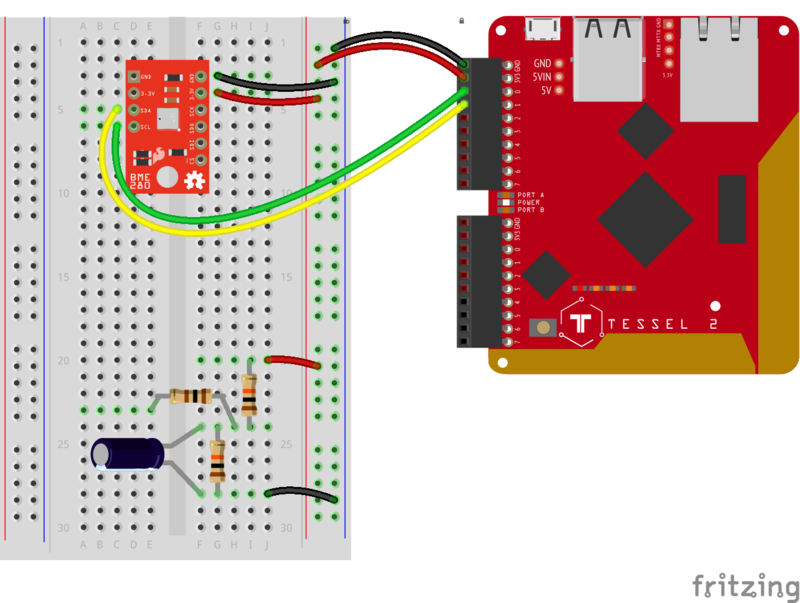 The application that we're going to create will post data reported by the BME280 and Non-Invasive Current Sensor circuit from the Tessel to data.sparkfun.com (that's why this application does require a connection to the internet). 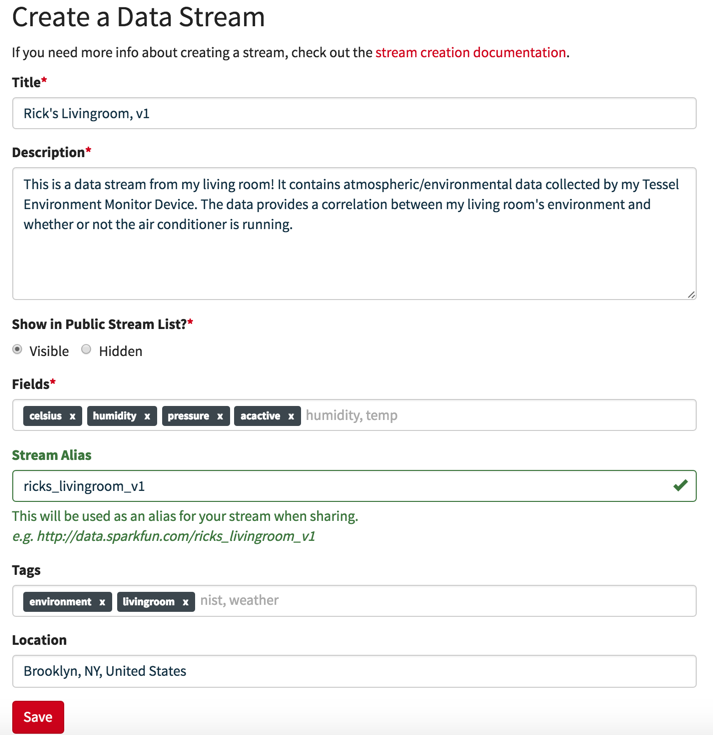 Before we get started with our own program, you'll need to create a new data stream on data.sparkfun.com so that you can send data to it from the monitoring device. You'll need to obtain the public and private keys for this data stream for use in the configuration of the air-conditioning monitor's code later. Below that section and at the bottom of that page, you will see an option to send the keys to an email address—I recommend doing this before you proceed. A nicer interface to the built-in http module. which is perfect for our project's needs! current.js: a module that exports a class called Current. Current represents a Non-Invasive Current Sensor and inherits from Johnny-Five's Sensor class. ac.js: a module that exports a class called AC which represents an Air Conditioner. AC inherits from Current. To provide a measurement of current in Amps, Current's data handler function needs to consider a number of individual data samples taken during a 1-second sampling cycle. Computations need to be performed on individual samples, and, at the end of each sampling cycle, a root mean squared current (rmsI) is calculated. Current objects then emit a measurement event and pass the rmsI along to anything that might be listening. rmsI is what we're after here—it represents the current going through the wire. Immediately following that, a new class, Current, is declared. Current extends the Sensor class provided by Johnny-Five. Sensor provides all of the base mechanics needed to implement a specific analog input sensor. 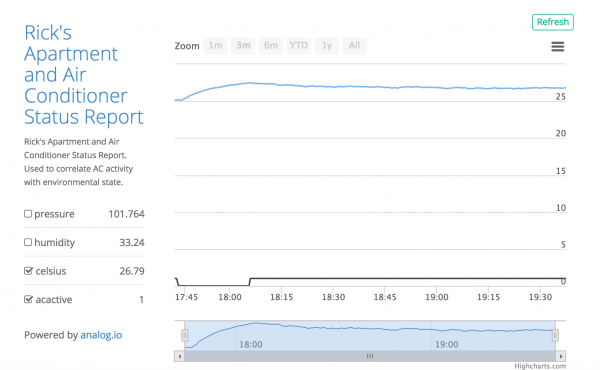 Current will extend Sensor and provide some things to support our current sensor. 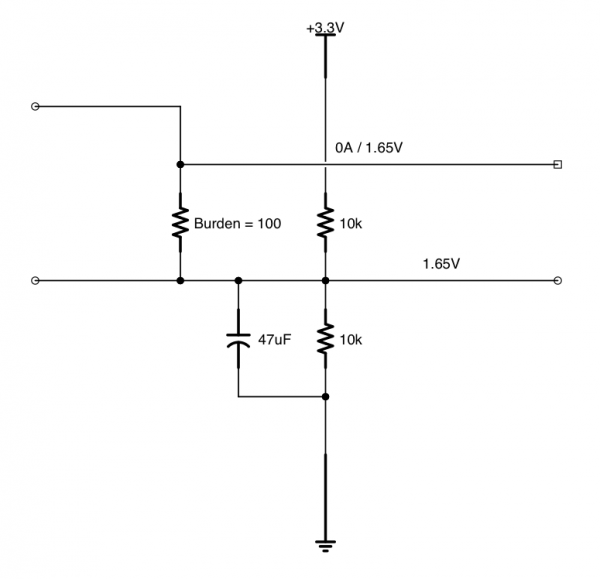 aref: the value of the particular board's analog reference, which is the top end of the voltage that the board expects in the analog input range. For the Tessel, we know this is +3.3V, but other boards have different aref values (e.g. Arduino Uno is +5V). this.io.aref should contain the analog reference for whatever board Johnny-Five is running on currently. cCount: track the number of "calibration" cycles that have passed. Calibration is set to occur over 5 1000-ms cycles—that is, the first 5 seconds of the instance's lifetime will be used for calibration. sCount: track the number of samples collected in each 1000ms sampling cycle. lastSampleI/sampleI: the value of the previous and present Amps (current, or I) value. lastFilteredI, filteredI, offsetI, sumSqI: Used within individual sampling computations. rmsI: the calculated root mean squared (RMS) Amps value for the sampling cycle. calibration/ratioI: calculated calibration and Amps ratio based on turn ratio—a characteristic of the current sensor's hardware—and burden resistor—100Ω in our circuit. More technical details). last: tracks the last time a sampling cycle completed. isCalibrated: initially false; will become true once the calibration cycles are complete. Next, we define a handler function for "data" events. These "data" events are defined within the super class five.Sensor. The only operation that occurs at the "top level" of this function execution context is to take note of the exact date and time (let now = Date.now()). data events fire frequently, about once every 25 milliseconds (this is the default sampling frequency of Johnny-Five's Sensor class). // the last time this path was taken. // It represents the end of a sample cycle. // function is invoked unless it's the end of a cycle. The first path handles execution when a full sampling cycle—1000ms or 1 second—is complete. First the rmsI is calculated for this sampling cycle, then resets some variables (sumSqI and sCount). The value of last is assigned to the value of now; this will result in starting a new sampling cycle when the data handler is next invoked. If the instance is done calibrating (isCalibrated), then it can emit a "measurement" event with the value of the rmsI for the sampling cycle. Otherwise it continues calibration. That's the end of the fork that handles the end of a sampling cycle. The other fork—the second primary condition—occurs almost every time the data handler is invoked, every time it's invoked and it's not the end of a sampling cycle. This fork performs several computations on the most recent current value read from the sensor. The calculations here are ported from OpenEnergyMonitor.org's "EmonLib". This second fork evaluates a single sensor reading. It increments the sCount (sample count) by 1 in order to track the total number of samples collected within a single sampling cycle. It then performs some calcuations on the current value, with an eye toward ultimately being able to produce a rmsI value for the entire sampling cycle. Back out in the top-level scope, the very last line exports the Current class object so that it can be used by other code modules. I'll skip mentioning this when looking at the code in other modules for the air conditioning monitor. The AC class has only one dependency—the Current class we just created. Just like with the Current class, the next step is to declare a new class called AC, which extends the Current class. Instances of the AC class will forward the value of setup.pin along to super(...) during instantiation. After the call to super(...), a let variable named isActive is declared and assigned an initial value of false. This will be used to track whether or not the air conditioner is active or not. (The air conditioner might be switched on all the time, but we only want to know when it's actually actively cooling). the handler first checks if the rounded rmsI is less than the value of setup.minimumI, which the application specifies as the "minimum amps flowing when the air conditioner is active". If it that condition evaluates to true, then that means that the air conditioner is inactive, so set isActive to false and return immediately. If that condition does not evaluate to true, that is: the value of the rounded rmsI is greater than or equal to the "minimum amps flowing when the air conditioner is active", then set isActive to true. Note that isActive is still the let variable declared outside of the event handler. The "measurement" event handler's job is to determine whether the air conditioner is active. It determines this by looking at the value of rmsI (the root mean squared Amps of the sample), which it receives as an argument. The setup object passed to the AC constructor includes a minimumI property. setup.minimumI defines the minimum Amps flowing when the air conditioner is active. If rmsI is less than that value, then the air conditioner is not presently active (isActive = false). Otherwise, we can deduce that it is (isActive = true). A bit about scope. isActive is declared within the function execution context of the AC class' constructor. So is the "measurement" handler function, so code within it can access isActive. However, isActive isn't accessible directly on AC instances yet—for example, if you had an AC instance called ac, there is no ac.isActive property—yet. What we can do is define an accessor property, also called a "getter", to expose the value of isActive on AC instance objects. Note that we're only defining a "getter", not a "setter". You can check the value of ac.isActive, but if you tried to set the value (ac.isActive = true), you wouldn't be able to (it'd throw TypeError: Cannot set property isActive of #<AC> which has only a getter). While this kind of protection isn't strictly necessary, it's important to me that I impart my preference for tamper-proof hardware state representations in my software. Before move onto discussing the actual application code, we have one last supporting module file to create: config.js. This module contains a single export, an object containing properties whose values are relevant configuration for our application. The interval property defines how frequently, in milliseconds, new data is sent to data.sparkfun.com. I've specified 10 seconds, but you may change this to whatever best suits your version of the application. Take care to replace [Phant Public Key] and [Phant Private Key] with the values generated when you created your data stream. If you followed my advice earlier, you will already have an email containing those values. "Phant-Private-Key": config.phant.private, // <-- don't publish this! // according to the specified interval. As you've seen twice already in this tutorial, the first thing we do is require the modules that our application depends on. This time, we're requiring got, johnny-five, tessel-io, as well as our own ac.js and config.js module files. Johnny-Five supports many kinds of development boards. The support for some boards is built right in to Johnny-Five, but others — including Tessels — rely on external plugins encapsulated in modules. That’s why the code requires the tessel-io npm module. Here, we tell Johnny-Five to use a Tessel object for IO when communicating with the board. Next, a "ready" event handler is registered for the board instance (which represents the Tessel 2 itself). The "ready" event will be emitted when Johnny-Five and Tessel-IO have completed their respective initialization phases and the board is ready to interact with. Before we start interacting with the hardware, there are two const declarations that get created. The value of url will be passed directly to got.post(...) and represents the API endpoint for posting data to your data stream, while the value of the payload.body property will be updated with the present environment values to send to data.sparkfun.com. Now we get to see our AC class in action! The program instantiates a new AC instance object and assigns it to ac. If you look back at the AC class constructor definition, you'll see that it accepts a setup argument, an object. The pin property of the setup object will get forwarded on to Current and then on to Sensor to tell Johnny-Five which pin the component is connected to. The minimumI value represents the minimum amount of current, in Amps, that the air conditioner uses when active. Immediately following the instantiation, the program registers a "calibrated" event with ac. Remember that AC inherits from Current? That means that the ac instance object will emit all of the events that come from its super class object as well. Very useful! The "calibrated" event will fire once near the beginning of the ac instance's lifetime, and when it does, the program will treat that as an indication that all systems are "go". ...all four of these sensors are packaged on the BME280. By making use of the Multi class, you can wrangle all four sensors with one component object. In the Johnny-Five Inventors Kit Guide Experiment 10: Using the BME280, you learned how to respond to "data" events from the BME280 Multi instance by creating a handler that forwarded values on to the browser via a WebSocket provided by socket.io. Once it's running, open your browser to https://data.sparkfun.com/streams/[Phant Public Key] and refresh it the browser as often as you'd like to see the data appear in your public stream. The stream that I created for this project is available here: https://data.sparkfun.com/streams/wp063JWw94CmL10wYw1W , which I exported to Analog.io and captured a portion that shows my own air conditioner going inactive, followed by a the temperature in the apartment rising until the air conditioner becomes active again. 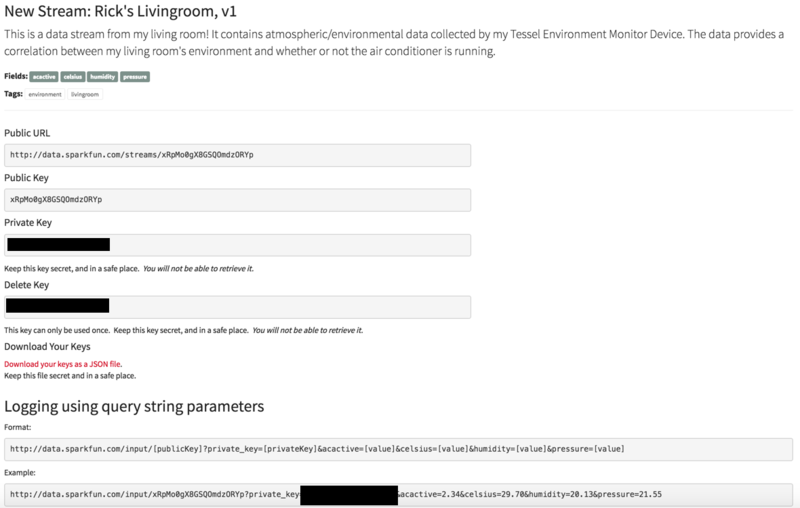 You can find all the files for the Environmental Monitor at the GitHub repository. For more Tessel fun, check out these other great SparkFun tutorials.